Work has begun on transcribing the comics. It’s all happening on the ELER Wiki, thanks to Roel Teuwen and Matt Lee. If you have free time and have read/write ability in English and perhaps other languages, then it would be great if you could contribute. Why spend effort transcribing something that has, at best, be only marginally funny and is updated once every few months? I would imagine that the effort would be better spent writing new comics or, better yet, new _funny_ comics. in the interest of technical accuracy, let me point out that patches to fetchmail should not be sent to ESR anymore. The new maintainers are at http://fetchmail.berlios.de/ . this comic is and it’s stupid and its’ two long. how can you steal someone’s eyebrows it makes no sence and who are the ones with the faces. what is all the writing in the squares. Don’t listen to them. Even though the strip is hateful, mean, and cruel, and usually philosophically slanted leftist/liberal/communist, it is still darned funny most of the time…. btw, even though Ciarán O’Riordan did do the original script we butchered it mercilessly ourselves. It made us laugh. The script development happened here and through discussion on #newworldodour on Quakenet. Do feel free to join in script discussion either through the wiki or irc. Then we can make it as funny as you like. An idea I’m currently working on is here. Help make it better. Does this mean Linus is going to come back as a ghost in the next strip? And is sending patches to fetchmail directly to Eric considered “endangering his tribe”? Is that why Linus got shot? I demand a Congressional non-binding vote to get answers to these questions! Good to see this webcomic is updated unlike mine. Is that Jim Gray on Linus’ shirt? john, forget about the criticism. If it makes you laugh, then you publish it. If someone else thinks it’s stupid then they can go make their own. Personally it made me laugh. Your new idea looks great too. You should just go for it and not worry any more about whether you can tweak it just a little bit more. Yeah, I thought this one was hilarious. Keep it up! Wow he says some rubbish in there. And I demand that your non-binding resolution vote is voted to be non-binding! The person on Linus’ shirt is Edsger Dijkstra. An armed open source community is a polite open source community…hahahahahha! Well, I thought this strip was hilarious, but I’ve been dwelling too much on ESR’s dweebish celebration of violence over the decades. Forget the whiners, I thought it was funny. OK, maybe the eyebrow thing flopped, but the other panels made me laugh! Please keep the comics coming! 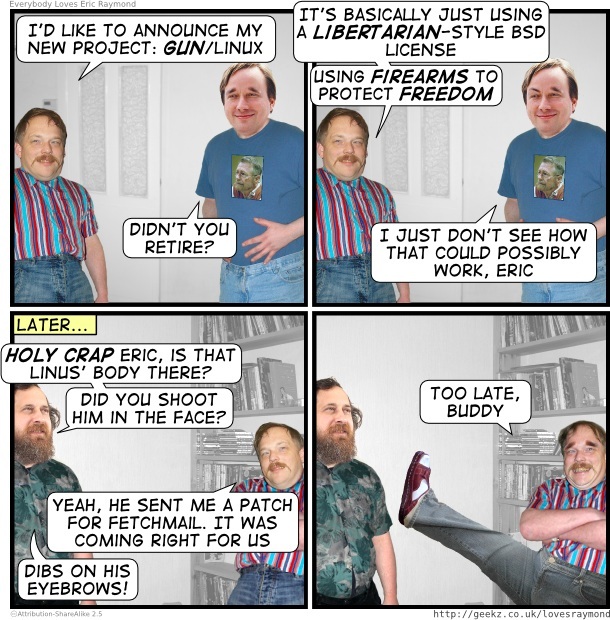 Not bad, but I think you ought to put a pointer in for the previous GUN/Linux comic, so that newbies can get the whole joke. Woot. Libertarianism all the way. (Seriously.) I’m not sure that sending a patch constitutes murderous self-defense, though.